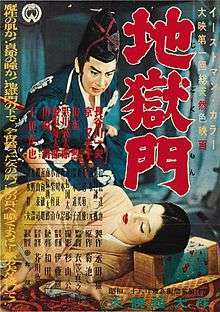 Gate of Hell (地獄門, Jigokumon) is a 1953 Japanese jidaigeki film directed by Teinosuke Kinugasa. It tells the story of a samurai (Kazuo Hasegawa) who tries to marry a woman (Machiko Kyō) he rescues, only to discover that she is married. Filmed using Eastmancolor, Gate of Hell was Daiei Film's first color film and the first Japanese color film to be released outside Japan. During a rebellion in 1159, the samurai Morito desires the lady-in-waiting Kesa, but she's married to Wataru. Morito decides to get rid of his rival. He makes Kesa explain to him how he can kill her husband while he sleeps. Kesa provides very precise instructions, yet when Morito follows through on her plan it is Kesa who gets killed. Morito understands that Kesa has sacrificed herself because she was determined to save Wataru's life and her honour. "The secret, perhaps, of its rare excitement is the subtlety with which it blends a subterranean flood of hot emotions with the most magnificent flow of surface serenity. The tensions and agonies of violent passions are made to seethe behind a splendid silken screen of stern formality, dignity, self-discipline and sublime esthetic harmonies. The very essence of ancient Japanese culture is rendered a tangible stimulant in this film." Gate of Hell currently holds a 100% approval rating on review aggregation site Rotten Tomatoes, with an average rating of 8.2/10. Gate of Hell won the Palme d'Or grand prize award at the 1954 Cannes Film Festival, a 1955 Academy Honorary Award for "Best Foreign Language Film first released in the United States during 1954", along with the Academy Award for Best Costume Design, Color, and the 1954 New York Film Critics Circle Award for "Best Foreign Language Film". It won the Golden Leopard at the Locarno International Film Festival. In the United Kingdom, Gate of Hell was released in 2012 on Blu-ray Disc and DVD by the Masters of Cinema; the next year The Criterion Collection released it in the United States. ↑ Crowther, Bosley (December 14, 1954). "Gate of Hell (1953)". The Screen in Review. The New York Times. Retrieved 2014-09-14. ↑ "Gate of Hell (Jigokumon) (1954)". Rotten Tomatoes. Retrieved July 19, 2016. ↑ "Festival de Cannes: Gate of Hell". festival-cannes.com. Retrieved 2009-01-25. ↑ "Awards for 1955". IMDb. Retrieved 2014-09-14. ↑ "Winners of the Golden Leopard". Locarno. Retrieved 2012-08-12. ↑ Nield, Anthony (2 December 2012). "Gate of Hell". The Digital Fix. Retrieved 2014-09-14. ↑ Prince, Stephen (April 10, 2013). "Gate of Hell: A Colorful History". The Criterion Collection. Retrieved 2014-09-14.